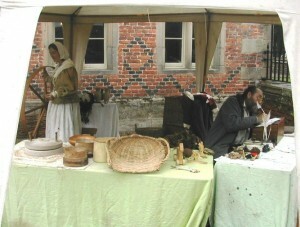 Rent A Peasant used not to venture into the seventeenth century as this period is covered in depth by the Sealed Knot and English Civil War Society. However, as the lower orders, we do get invited to cover aspects of this period. We got soaking wet trying to put out the Great Fire of London for a Granada television pilot. More recently we have demonstrated some C17th recipes at the William Turner Garden in Morpeth and laid out a display of Banqueting Stuffe for the 400th anniversary of James 1 granting a charter to Ripon. Our usual Tudor costume suffices for the early years of James’ reign. 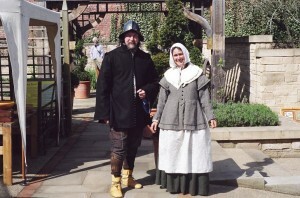 For Charles I and the English Civil War, we have recently acquired a range of new costumes which include some “dressing-up” clothes for young people to try on. 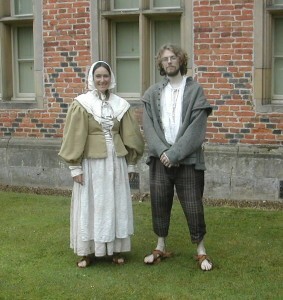 Rent a Peasant with the Mayor of Ripon at the 400th Anniversary of the granting of the town charter by James I and VI, June 2004.